EAST RUTHERFORD, N.J. -- The New York Giants aren't in tear-it-all-down mode. They're building, according to general manager Dave Gettleman. In his mind, that doesn't preclude the Giants from making noise this year. 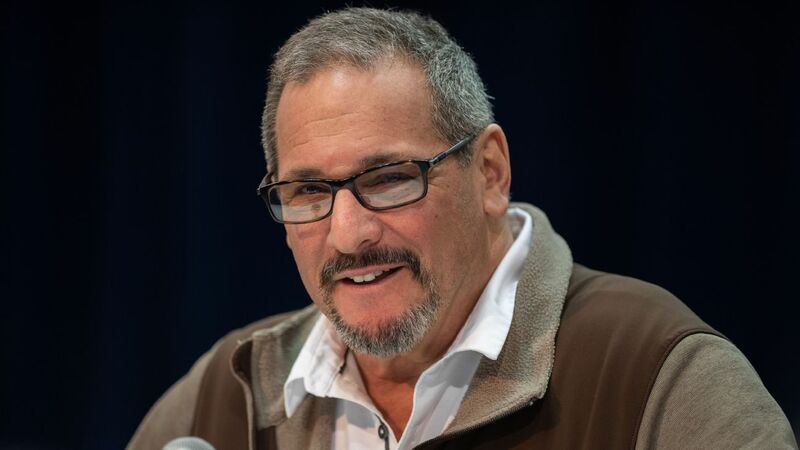 "Really and truly, you can win while you're building," Gettleman said Monday on a conference call with reporters to discuss the trade of star wide receiver Odell Beckham Jr.
Beckham was traded last week to the Cleveland Browns. The Giants received first- and third-round draft picks and third-year safety Jabrill Peppers in return for the Pro Bowl receiver. The deal came on the heels of outside linebacker Olivier Vernon also being shipped to Cleveland and Pro Bowl safety Landon Collins leaving as a free agent to sign with the Washington Redskins. The Giants have since signed wide receiver Golden Tate, who will turn 31 in August,as Beckham's replacement. It leaves their short- and long-term plans cloudy. "We're building. The object of this is to win as many games as possible every year," Gettleman said. "So we're building. We were 3-13 when I took over. We were 5-11 last year -- 12 of those games were a touchdown or less. We're building. I don't understand why that is a question." Gettleman declined to provide further details for where the organization is headed after the team traded its biggest star following a stretch in which it has missed the playoffs in six of the past seven years. "Trust me, we have a plan. And over time, you have to be patient. Everybody wants answers now. We live in an instant gratification society, instant gratification world, and everybody wants answers now," Gettleman said. "Over time, you'll see it. You have to trust it." Gettleman insisted he wasn't desperate to trade Beckham and that it was purely a football decision. He said it had nothing to do with any specific incident in the seven months since Beckham signed a then-record $98.5 million deal with the Giants. "There is no intrigue. There is no he said, she said," Gettleman said. "None of that stuff." Gettleman looked at the starting point for Beckham's value as the equivalent to the franchise tag, which would bring back two first-round picks in return if he signed elsewhere on the tag. The Giants view Peppers as the equivalent of a first-round pick (he was a first-round selection by the Browns in 2017). They also received the No. 17 overall selection and a third-round pick. That was a better offer than anything the San Francisco 49ers or Buffalo Bills presented. Gettleman called the Bills and had several discussions over time with 49ers general manager John Lynch. "As I said publicly twice, we didn't sign him to trade him, but obviously things changed," Gettleman said. "Frankly what changed is another team made an offer we couldn't refuse." Gettleman has said in the past that you don't give up on talent. He doesn't view the Beckham trade as such because the Giants didn't cut him or get a marginal return. They received legitimate value. The Giants are now moving forward without their most popular player. They are also keeping Eli Manning at quarterback and are optimistic that the offense's improved play late last season -- when Beckham was sidelined with a quad injury -- can carry over into this year. Manning and the Giants averaged 25.5 points over the final four games of the season. Manning also threw 13 of his 21 touchdown passes in the second half of the year, after the offensive line stabilized. Gettleman is sold on the two-time Super Bowl winner, even if he's 38 years old and coming off several down seasons. "So, again, this narrative that Eli is overpaid and can't play is a crock. I'm telling you," Gettleman said. "So at the end of the day you have to say Gettleman is out of his mind or he knows what he's talking about when he evaluates players. That is really what it is. That is really where it's at. And I'm OK if you disagree with me. That's fine." Manning is scheduled to make $17 million this season. He already earned a $5 million roster bonus by being on the roster Sunday. While Beckham and Vernon were traded and Collins left in free agency, Gettleman said there was never any doubt about Manning. "What I'm telling you," Gettleman said, "is if you turn around and take a look at what he's making right now and look around the league and see what quarterbacks are making, if you're in my shoes you'd say ... the way he finished the season and what he is making, there really wasn't a decision to make." 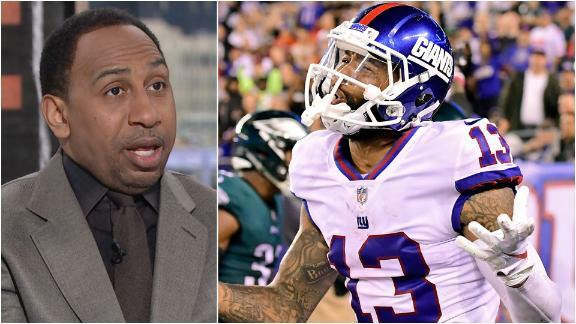 While Stephen A. Smith doesn't like the Giants trading Odell Beckham Jr. away, he doesn't blame the team for making the move.